Honey is something Pooh can never be content with; kids on the other hand can never be content with seeing enough of Pooh. From the time A.A. Milne brought to life these most loved animals in his book in 1926, ever since then kids of all times have grown up on the silly antics of Winnie the Pooh and his friends. Now two theater companies are going to launch Pooh tales. 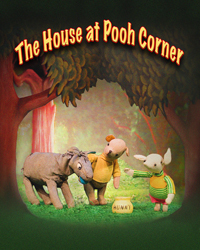 The Dallas Children’s Theater presents the Kathy Burks Theater of Puppetry Arts’ production of The House at Pooh Corner. This show runs till March 30. The Irving Arts Center showcases the musical adaptation of Winnie the Pooh that is taking place on February 29. In this production a lot of things change for Pooh and his friends. Pooh and Piglet help Eeyore build a house, the friends help Owl move after his tree is blown down and Christopher Robin departs from the Hundred Acre Wood to join school. The puppets are with the Kathy Burks Theater of Puppetry Arts’ since 1971 and are the same that performed in the White House for President Roosevelt. The puppets were sculpted by Harriet Babcock. Ms Babcock is believed to have used her daughter Louise as a model for the face of Christopher Robin. Louise Pauly now 78 years old found out a few years ago that Ms. Burks had bought the collection of more than a thousand puppets. Ms. Burks takes care not to over use these puppets and it will be only the 2nd time in 2 long years that they will be used after receiving a rest in excess of two decades. The puppets are still in great shape and have stood the test of time quite brilliantly. Rosewood Center for Family Arts is hosting this event Fridays at 7:30 p.m., Saturdays at 1:30 p.m., Sundays at 1:30 and 4:30 p.m. Additional performance March 8 at 4:30 p.m. For more information visit dct.org. A completely new live-action musical, Winnie the Pooh has his plate full. He has to finish off his stoutness exercises, get hold of a heffalump, play a prank on Kanga and Baby Roo, and find Eeyore's missing tail. There is no end to there fun here and there will be a lot of dancing and singing in this show produced by Two Beans Production for TheaterWorks/USA.